Well, I can't say I aren't bloody jealous of such initiatives. Honestly, I wish I had a lottery windfall because I'd do this. Isn't there a way we as fans can get our heads together and raise money to do something along these lines for next season? Im willing to help out and I'm offering whatever services I can do to make such things happen if anybody is interested? It's been on my mind for a while now. C'mon, there's a few clever clogs amongst us who want the same, isn't there? In the words of Whitney Houston, "I believe the children are our future!" No chance of that happening here. All under 12s should be free entry to games. I got hooked as a kid paying nothing/very little, getting free tickets at school etc. My son and daughter aged 5 and 10 have never come home from school with any free ticket for a Halifax game. Maybe someone can mention it to the chairman at the meeting and see if he feels it has any legs? I am up for getting together and trying to sort something. Somebody told me the other day how the rugby fans had got together and were doing all sorts to help the club. The rugby club gets some unfair criticism on here but well done. For all the Rugby Clubs failings they do have a good presence in and amongst the junior clubs. For me that is an historical thing as so many local lads have played for the local professional team over the years and that relationship has developed because of that. That's what I'm talking about. Aren't a lot if their fans signed upto a direct debit that takes a tenner out each month? It goes towards buying merchandise for the kids, away coaches, free tickets. For the sake of a pint every week! Yes, away travel is cheaper for the rugby but their fans put us to shame with great initiatives I'm afraid to say. I believe so. Haven’t they chipped in to sign a player as well? U12 season tickets are free. People will say the usual such as, "why can't Bosomworth pay"
"we already pay enough on season tickets or entrance fees"
For me, potential money making schemes isn't about lining the pockets of Mr David Bosomworth. I feel it's investing in our own fans and supporters. More supporters at home and away games, happier supporters breeds success. Asking fans to chip in for someone else's kids to get in for free? You must be flush. U'16's should be free from this day onward. Take a look around at The Shay on a match day, Shaymen are a dying breed. The Club would lose nothing and they would help secure the future. There is so much competition in West Yorkshire we are lagging behind. The BOD have to act and at least match the initiatives given by other Clubs. Asking people who already pay over the odds and go to chip in is ridiculous. I've hardly a penny to rub together, and despite that, I aren't a tight get. I'm trying to offer a solution to a problem that we all moan about and wish we could rectify. I don't live in a fantasy world, but sometimes it pays to do something nice and have some pride in my hometown. Surely it is not going to cost much more than the cost of producing more season tickets as most under 12s are likely to attend with a paying adult and any new under 12s who attend without an adult probably would not have attended previously so it should not result in reduced revenue. Perhaps Mr B can explain the Board's thinking on this in view of HLRFC initiative. Who would have thought that Salford and Afc Fylde where the crowd was one man and his dog used to attend have now got young fans,before that old chestnut comes out because they have rich owners Halifax overnight stopped having kids that's why we have so many old fans but yet when the team are playing well the South Stand lads are brilliant at backing the club but this year they are getting fed up but hey now got some gadget which gives us a much better match day to look forward to but does not seem to be working. All kids of school age should be Free don’t get it that an 11 year old is free and 13 year old pays neither work or earn money ,If we want to build our fan base free admission for kids is the only way forward,An online ticketing system like AFC Fylde have should be introduced with the incentive of a cheaper match day ticket all questions for the Chairman. Do you know how Flyde have achieved their young fans and done away with the dog? It would be interesting if you knew what their approach has been and then to see if it could be replicated here. BTW I don’t mean buying a team, I mean making the match day experience good and encouraging new fans to attend ie offers, advertising etc etc. Good idea by the rugger lot but as with all these schemes it's dependent on a full paying adult attending with them. 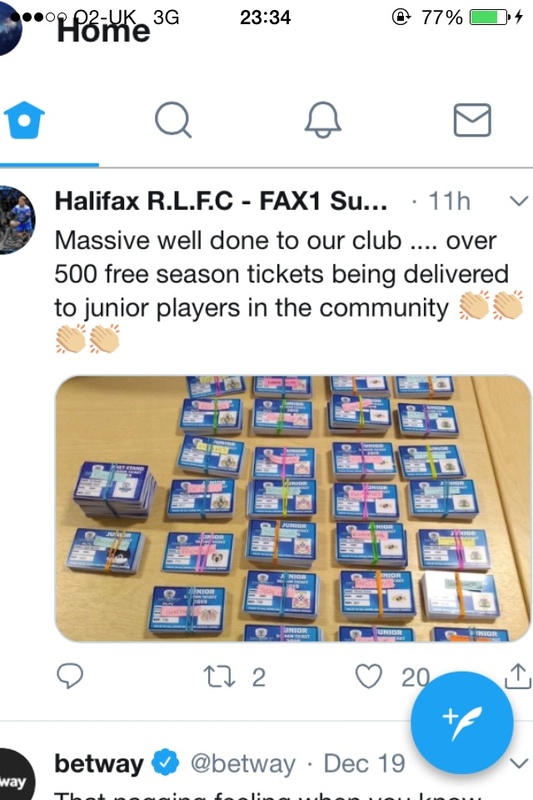 We have tried similar initiatives and maybe five or six years ago myself and the then commercial manager distributed over 400 free under 16's tickets and less than twenty were used. We have the free kids season ticket with full paying adult which is good but i agree with other posters that the whole on the day pricing structure for under 16's needs reviewing to catch the next generation of shaymen. Find a local business that is willing to contribute however much a year. U17 season tickets are £99, 500 tickets at this price is £50,000 revenue potentially, but I doubt very much that we sold 500 u17 season tickets in 2 years, never mind just 1. I’d guess maybe 100-150 a year absolute maximum, get a business to sponsor £10,000 or so, to provide free football for children in Calderdale. Print as many free season tickets as you like, and we will get kids in, no cost to them but we don’t actually lose out financially due to the sponsorship.